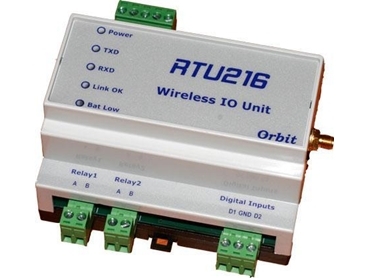 Orbit Communications releases wireless RTU216 wireless IO unit. The RTU216 is a wireless IO unit that has been designed to provide a reliable and cost effective wireless control/monitoring link in the busy radio environment. Utilising proven RF technology, the RTU216 wireless IO yields a flexible solution for wireless applications coupled with a fast route to market. The RTU216 wireless IO unit is built robust for industrial applications in electrical noisy environments to withstand voltage spikes and other EMI on any of the inputs, outputs and power supply. The RTU216 wireless IO units can be provided with custom software to enable multiple remote stations or a Network of devices. Each end of the link continuously monitors all over-air communications. Indicators on the front panel show transmit and receive activity, Link status and Battery state of remote end of link. Typical applications include Irrigation control systems, bore pump control, tank monitoring, industrial machine monitoring/control etc.